Nanette A. McCarthy obtained her B.S.B.A. from Lawrence Technological University and her Juris Doctor from DePaul University School of Law in Chicago. Nanette began practicing family law in 1995 and, in 2003, started Griffin & McCarthy, LLP, as one of two founding partners. Now known as Griffin McCarthy & Rice LLP, the firm is an ten attorney boutique law firm practicing exclusively in family law. Nanette has been selected an Illinois Super Lawyer in the area of Family Law from 2009-2017, is a fellow of the prestigious American Academy of Matrimonial Lawyers, a fellow of the Collaborative Law Institute of Illinois and member of the International Academy of Collaborative Professionals. Nanette has also received training in negotiation at the Harvard Law School Program on Negotiation. In 2012 and 2013, Nanette was a faculty member of the Houston Family Law Trial Institute at the South Texas College of Law. In 2013, Nanette began serving as president of the Illinois chapter of the Association of Family and Conciliation Courts (AFCC). 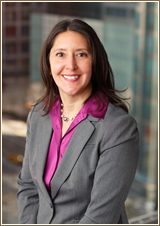 Nanette is a member of the Chicago Bar Association Committee for Matrimonial Law and Adoption Law. Nanette has been appointed by the Cook County Court to act as a child’s representative and guardian ad litem in custody and visitation proceedings. She engages in continuous training to maintain this qualification. Nanette has extensive experience working on cases with complex custody issues, including cases with special needs children, mental health issues and international removal. Nanette has worked with clients in collaborative, traditional litigation and mediation settings to resolve disputes. Nanette’s undergraduate studies focused on accounting and finances. She has spoken at numerous engagements on the topic of matrimonial law, has published articles on family law topics, and has written many briefs for the Appellate Court of Illinois. Nanette recently had an article published in the February 2013 ISBA Family Law Newsletter regarding non-customary parentage law cases.